William Richard Webb was born in Headington Quarry in 1878 and baptised at Holy Trinity Church on 28 April. His father William Webb was born in Henley Workhouse in 1856 to a single woman, Ann Webb of Pyrton, and at the time of the 1871 census was living in Headington Quarry but recorded as William Jones (as his mother had married a man called Louis or Lewis Jones): he was then working as a labourer, probably in the brickyard. William Richard Webb's mother Sarah Keary or Kerry was born at Cowley Marsh in 1855 and baptised at St James's Church in Cowley on 18 November. She had also come to Quarry as a child in c.1859 when her father, the higgler Richard Pinnell Keary (or Kerry), settled at Shotover Hill Place with his widower father of the same name. Charles Henry Webb (born in Quarry in 1886 and baptised at Holy Trinity Church on 30 May). The 1881 census shows William Richard Webb (3) living at Clerk’s Row in Headington Quarry with his father William (25), who was a brickyard labourer, his mother Sarah (25), and his sister Sarah Ann (1). Around the time of William’s eighth birthday in 1886, his father William Webb (30) died of a lumbar abscess, and was buried in Holy Trinity churchyard on 30 January. By the time of the 1891 census William (13) had moved to the home in Quarry of his paternal grandmother, Mrs Ann Jones, née Webb (54) and her husband, the agricultural labourer Lewis Jones (55). Meanwhile his widowed mother Sarah Webb (37) was working as a laundress and living in Quarry with William's two surviving siblings Harriet Maud (8) and Charles (6). died the next day at the age of three weeks and buried in the churchyard on 30 January 1897). At the time of the 1901 census William Richard Webb (23) was a blacksmith, and was still boarding with his grandmother Ann Jones née Webb (63), who was working as a laundress, and his step-grandfather Lewis Jones (63), who was still working as a labourer on the parish roads: their address was given as Winterbourne’s Piece in Headington Quarry. Meanwhile his mother Mrs Sarah Ward (48) was still a laundress, working on account in her own home at Wesleyan Terrace in Quarry: with her were her second husband John Thomas Ward (45), who was a builder's labourer and their children Oliver (7) and Sarah (5), and also two of her children from her first marriage: Harriet Webb (18), who was working as a laundry maid, and Charles Webb (16), who was a brickmerchant's carter. Also living with them was Mrs Ward's unmarried sister Clara Kerry (36), who also worked as a laundry maid. William Richard Webb’s mother Mrs Sarah Ward died in 1908 at the age of 54 and was buried in Holy Trinity churchyard on 18 March. William Richard Webb is hard to find in the 1911 census. His stepfather John Ward was living in Quarry High Street with William's siblings [Maud] Harriet and Charles Webb and his step-siblings Oliver and Sarah Ward. It is possible that William married not long before his death, as a William R. Webb married Ethel M. Bushnell in the Headington registration district in the last quarter of 1917. In the First World War William Richard Webb served as a Shoeing Smith in the 282nd Brigade of the Royal Field Artillery (Service No. 98980). 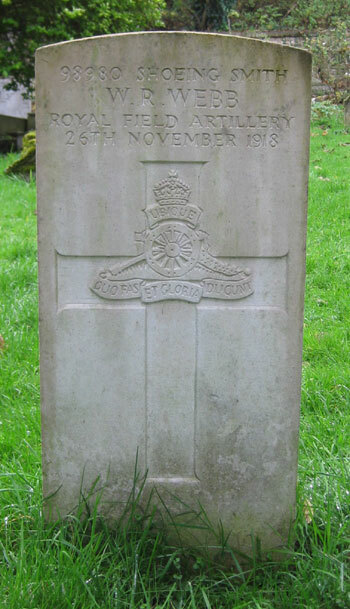 He was presumably brought back home wounded or ill, as he died at the Third Southern General Hospital in Oxford at the age of 40 on 26 November 1918. He was buried in Holy Trinity churchyard four days later. William Richard Webb’s is also remembered on the stone plaque in the porch of Holy Trinity Church. Maud Harriet Webb (born 1883) married the bricklayer William Thomas Lee at St James's Church in Cowley on 6 September 1902: they were both then living at Hensington Square in Cowley. Her first husband died of influenza in 1918 at the age of 36, and on 31 July 1920, again at St James's Church, Mrs Maud Harriet Lee (36) married her second husband Herbert William Harvey (36). She died at the age of 77 and her funeral was held at St James's Church on 25 February 1961. Charles Henry Webb (born 1886) was still working as a labourer in Headington Quarry when he married the widowed Old Headington laundress Mrs Agnes Maud Morris (39) at St Andrew's Church on 23 November 1919. Charles died at the age of 79 and was buried in Headington Cemetery on 2 January 1964, and his wife Agnes died at the age of 97 and was buried with him on 8 November 1968.